I've just been told by Ectaco that they will be shipping their newest ebook reader to the US in December. And yes, they plan to sell it for $30 less than the Kindle DX. This is the first color epaper ereader to hit the market anywhere, and it's based on a 9.7" color E-ink screen, with a SD card slot, Wifi, and a Wacom touchscreen.The rest of the specs are not finalized just yet. I'm not sure that ebook reader is actually a good term for this device; it's not targeted at the same market as the Kindle DX. The Jetbook Color is an academic product. It's running a lot of customized software that you don't find on your usual ebook reader, including test-taking, scheduling, reference sheets, and other apps that schools have requested. It will also have TTS courtesy of SVOX, a specialist. According to Ectaco, this model has been under development in Russia since May. Ectaco has a deal signed with the Russian government to customize the software for Russian schools. For more ebook news, subscribe to the RSS feed or the daily email newsletter. Or you can follow me on Twitter: @thDigitalReader or find me on FaceBook. Well, this is aimed at the academic market. I guess, but I still think almost everyone will just get a tablet instead at that price. 800×600 resolution is what my Pandigital has. Passable on a 100 dollar 7 inch device. Can’t imagine it would look even halfway decent on an iPad sized screen. 800×600 will likely look better than the numbers show. A pixel is actually 4 of the monochrome pixels with filters for 3 colors and white. The controller supports subpixel sampling for anti-aliasing which should make it look higher. 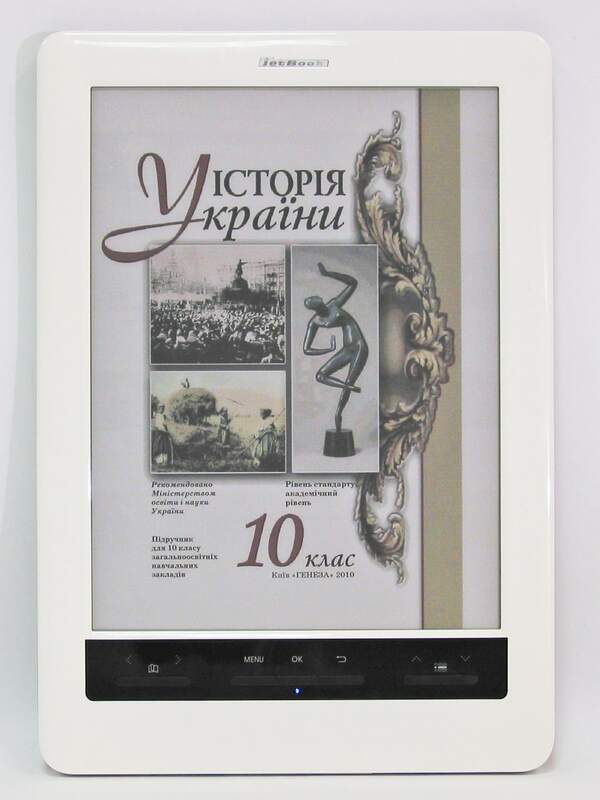 Maybe it’s not a bad election if you want a 9″ ereader and you have to choose between Kindle DX or this one. If there are people who buy a Kindle DX, why not a Jetbook? I would like to see the representation of an ebook on this device. The pictures on Ectaco’s website are clearly mock-ups. I wouldn’t base any decisions on those. That is actually awesome. I would not have expected that from ECTACO. Way to go up. There is color in that screen? Where? Parece que existe um pouco de cor naquela tela. Oaulo, você tem algum aparelho da Ectaco? Tem um Jetbook? Perdão… não Oaulo e sim Paulo. Will it be available only for Russian and American educational market? I’ll explain myself, Could an individual buyer get it? I beleive Ectaco will carry it for the retail trade, yes. TY Nate. I can see in this device a good potencial, maybe a little slow with color images but its O.S. with a lot of features and functions, and the price slighty minor than Kindle DX are enough advantages for me. And I would suppose with a normal ebook (not color) the device answers will be very good.